I studied Taekwon Do (the Korean martial art) for several years, so I got pretty good at shouting instructions such as Spinning back kick and X-shaped block in Korean. I also learned to count as well as learning a few small bits and pieces of Korean history. 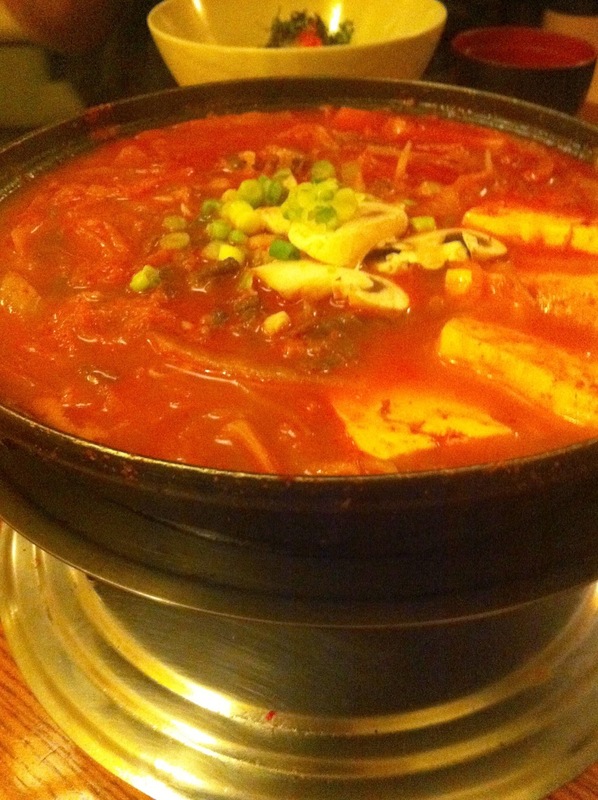 However, Taekwon Do classes didn't prepare me to order Korean food. All the punching and striking instructions in the world don't really count for much when faced with the menu in Kimchi restaurant, part of the Hophouse bar on Parnell St (unless you want to intimidate the waiter into bringing you food). Primarily based on rice, vegetables and meats, there is a strong Japanese flavour to Korean food (due to it's proximity with Japan, and indeed the Japanese invasion of Korea). Kimchi restaurant is named after one of the staples of Korean cuisine, namely a dish made from different types of pickled vegetables. I've long been a fan of Korean restaurants (having enjoyed my first meal in Dusseldorf in 2000) and have tried the entire range in Dublin with mixed results. Kimchi is a simple restaurant with a varied menu. We considered sushi for a starter, but instead chose two sushi type dishes. He had carpaccio of sea bream served with a zig zag of wasabi sauce (€8.00). A tiny cracked pink peppercorn was perfectly positioned on each slice, along with a small serving of oriental dressed salad. My choice was seared peppered tuna, rolled in sesame seeds and served with an avocado mousse, salad and a sweet dressing (€9.50). There was plenty of the tasty tuna, but the avocado mousse was underwhelming and could have benefited from a wasabi kick. For a main course, he chose the unfamiliar tuna dubap which turned out to consist of a bowl of sushi rice, topped with fragrant marinated tuna, dried seaweed, cress and onion, topped with all the sushi elements of ginger, wasabi and soy sauce (€12.00). It was a dish with particularly elegant flavors and was very light and refreshing. I had opted for a spicy selection, the sogogi kimchi jeongol, or spicy kimchi and beef stew with tofu and vegetables served in a traditional Korean burner (€14.80). A massive shallow bowl arrived at the table atop a burner, whose intensity could be controlled via a sliding cap. After watching heated bubbles rising from the lava depths, I decided to close the shutter contraption with some nudges from my chopsticks, and keep the boil under control. The broth wasn't too spicy in the end and was well flavored from the kimchi. Thin slices of beef and silken tofu were good at soaking up the spicy flavour. It's worth mentioning that Korean chopsticks tend to be thinner than those from China or Japan, and are frequently made from metal. This means (to me at least) that they are a little harder to manipulate. Total cost for our meal, including two Korean beers at €4.50 each, came to €52.30. This was really good Korean food and the best part about the meal was how healthy, light and flavoursome the food was. I should also give a shout out to one of our male waiters, whose blow-dried super-shiny, super-styled hair, was really quite impressive. He clearly thought so too, because he could frequently be seen looking in the mirror, making minute adjustments, between service. I think that Kimchi could be the best Korean restaurant in the city. Personally, I love the Hilan on Capel Street, but that isn't exclusively Korean cuisine. The last thought that crosses through my head is that I must resist the temptation to title this review something along the lines of "Seoul-food" or the likes. Kimchi Restaurant, Hophouse, 160-161 Parnell St, Dublin 1.